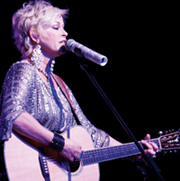 Grand Ol’ Opry star Lorrie Morgan recently performed in Duncan for an exclusive night of live music. Other than a few technical setbacks, I would say the night was an overall success. Morgan started the concert with one of her first hits, “Trainwreck of Emotion,” but did so with a rocky start. Not a great way to start a show to say the least, but the elderly demographic of the audience was sure to bypass such a blunder. Of course, being a glamorous country star and a woman of class, Morgan still worked the stage as if it were her first performance. For a career that has lasted more than 25 years, it is fair to say her concerts have just as much excitement and energy as when she first started her musical journey. Though I admit to be the first to brazenly flog her newer album releases, there is little to suppress when it comes to a live Lorrie Morgan concert despite whatever technical difficulties may have arisen. Some of her first hits such as “What Part of No Don’t You Understand” or “Something In Red” were the ones most well received by those in attendance. I think Ms. Morgan knew her number-one fan was among those in the audience, as she played a personal favorite of mine, “Except for Monday,” which was a big hit for her in the early ’90s when she was still with RCA records. Before performing “Mirror, Mirror,” she comically explained how she ended up writing the song with fellow producer Mark Oliverius. If her musical career ever ends, I think Morgan could catch a spot on Comedy Central. Though the aging process has been a little less than kind to her in regard to her vocal deliveries, the 52-year-old still puts on an engaging show for any ol’ country music fan. Morgan still radiates an enchanting attractiveness that shuns the younger names in show biz. If her voice doesn’t do it for ya, her looks certainly will. I would say that for a Lorrie Morgan concert, it was just enough to keep my soul sustained.